Gold softened overnight in a range of $1311.20 - $1317.50, trading inversely to movements in the US dollar. The dollar strengthened through the night, boosted by weakness in the yen (105.91 – 106.60, miss on Japan’s Leading Index and Machine Tool Orders), the euro ($1.2355 -$1.2285, German and Eurozone ZEW readings less than expected), and the pound ($1.4067 - $1.3992, miss on UK CPI). Global equities were mostly firmer and a headwind for gold with the NIKKEI down 0.5%, the SCI up 0.4%, European shares ranged from +0.2% to +0.3%, and S&P futures were +0..2%. A rally in oil (WTI from $62.10 - $62.95, Saudi / Iran tensions, IEA report that Venezuela was vulnerable to accelerated output decline) aided the rise in stocks. US equities opened stronger (S&P +12 to 2724, energy sector leads gainers), and the US 10- year bond yield firmed to 2.889%. 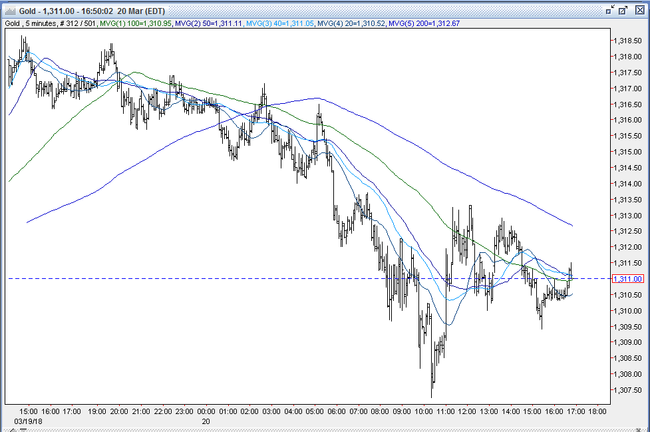 This boosted the dollar further, pushing the DX up to 90.33. 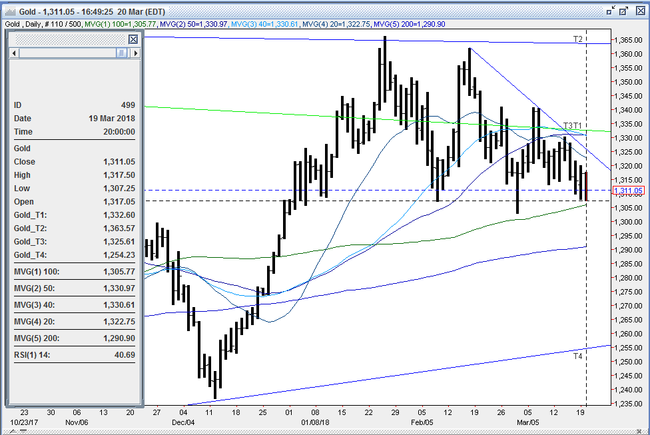 Gold continued to weaken, but found support at $1307.25, just under yesterday’s low. However, stocks weakened during the late morning hours, and turned negative by mid-day (S&P -3 to 2712), despite oil rallying further (WTI to $63.95). The 10-year yield ticked down to 2.876%, and DX pulled back to 90.19. Gold came off of the floor - with some bargain hunting bids seen - and rose to $1313 (resistance at the old support level). In the afternoon, US stocks turned back higher (S&P finished +4 to 2717), while the 10-year yield touched its prior high at 2.889%. The dollar made a fresh high at 90.40 (3-week high), and gold turned lower. However, decent support was seen and the yellow metal’s decline was limited to $1309. It was $1310 bid at 4PM with a loss of $6. Open interest was up 6.8k contracts, showing a net of new longs from yesterday’s advance. Volume was higher with 355k contracts trading. With solid advances in the DX (3-week high) and the US 10-year yield (approaching 2.90%) bulls should take solace in that gold held up fairly well – north of its 100-day MA at $1306 and 2/28 low at $1303. After having fallen $34 over the past 9 sessions, they’re looking for the FOMC statement and Powell to be a tad dovish to chase some recent new shorts out of the market. Bulls will need to overcome initial resistance at the $1320-22 double top to be able to challenge the down trendline from the 2/16 $1362 high at $1326 followed by the $1328 -30 – quadruple top (3/8, 3/13, 3/14 ,and 3/15 highs). Above here, they see a vacuum up to the triple top at $1341. Bears remain comfortable selling into rallies, and expect Powell and company to tilt toward the hawkish side to take higher bond yields and the dollar higher and pressure gold lower. They will look for a breach below support at the triple bottom at $1307-10 to bring into play key support at $1303-06 (100-day moving average, 50% retracement of up move from 12/12/17 $1236 low to 1/25/18 $1366 high,3/1 low). Below here, bears expect further long liquidation to lead to a test of the 200-day moving average at $1290. All markets will continue to focus on the volatility in the equity and bond markets, geopolitical events, developments with the Trump Administration (especially tariffs/dismissals), oil prices, and will turn to reports tomorrow on UK Employment, US Existing Home Sales, Oil Inventories, and the all-important FOMC meeting statement and first press conference as Fed Chair by Jerome Powell for near-term direction. Kudlow on gold – Admin stooge or?